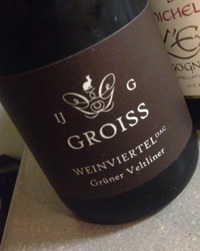 2013 Weingut Ingrid Groiss, Gruner Veltliner, Weinviertel DAC, Austria. Wow, what a fabulous wine, this was my first experience tasting the Groiss wines from Weinviertel, a region north of Krems, in an area not readily discovered or known in the States, and made by the talented winemaker Ingrid Groiss. If you were ever wondering why Gruner is so popular with wine geeks and sommeliers, then find this wine, and don’t miss out on this particular vintage either, this is stunning stuff. The 2013 Gruner from Groiss is vibrant and striking with a cascade of gorgeous tangy/zesty fruits, sizzling/piercing acidity and charming complexity, showing intense force (drive), mineral essence and impeccable poise, this is very expressive and impressive, it has an almost Riesling like energy and vigor, but remains true to varietal profile, this region has Loess soils and it has less Danube influence than the Wachau or Kremstal, but is non the worse for it. I hope to explore more from Ingrid Groiss and after sampling this wine, will be a devoted fan I’m sure. This Weinviertel 2013 Gruner starts with a peachy note, lots of citrus and steely elements with lemon/lime, grapefruit, tangerine and unripe green apple, hints of pineapple, wet stones, chalky brine, almond oil and minty herbs. This wine, like many from this vintage show a heightened, electric like, vivid nature, this is a great year for Gruner Veltliner, and Ingrid Groiss has captured the best the year had on offer and took it to a great place, this is definitely a wine to get excited about and is a remarkable value, a big thank you to Stevie and Josiah at Bay Grape in Oakland for turning me on to this wonderful wine and artisan producer. This 12.5% light to medium weight wine with brisk and crispy focus would be an ultra fantastic picnic wine, perfect with oysters and is super refreshing, sadly summer is gone, but it should drink superbly for another 3 to 5 years easy. This is a winery to watch, I enjoyed this as much as Knoll, Nigl and Brundlmayer, which are some of my very favorite wines, drink from 2014 to 2018.